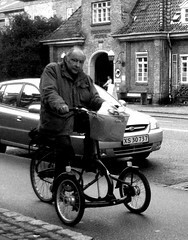 The whole cargo bike concept was born in Denmark over 70 years ago and there are few places in the world where so many versions of the cargo bike are to be found. These cargo bikes are enjoying a renaissance now that other markets on a global level have discovered the concept. We have an earlier post about some of the many brands of cargo bikes in Copenhagen, but we thought we'd add another post about even more brands. The one above is the Winther Kangaroo Bike. We've never had the chance to ride one, but we're seeing more and more of them on the streets around us. Above we see six wheels in all - the first one is a classic Nihola Cargo Bike and the one of the left is a typical bike used by our elderly citizens who are a little less mobile than they used to be. Perfect for shopping for groceries and getting around a lot quicker. 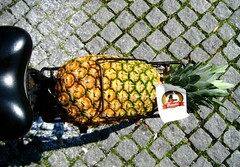 The two photos above are examples of the old classic delivery bike. 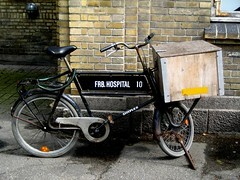 The first photo is taken at a hospital, where like many institutions, bikes are used to get around. Delivering the internal post, supplies, what have you. 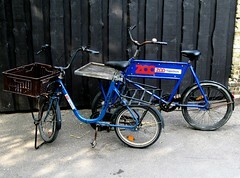 The second photo is from the Copenhagen Zoo, where the different zookeepers have bikes that belong to the different exhibits. The ones featured belong to the Tapir House. The good people at Velorbis are now producing these Short Johns again. Which thrills us to no end. 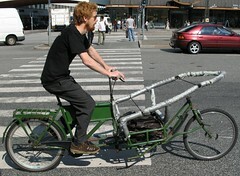 Above is the classic Long John cargo bike, first built back in the 1930's and now being born again by Velorbis. 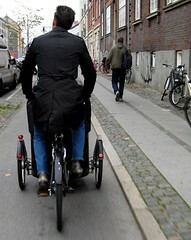 I've seen this chap a few times in Copenhagen and was totally curious as to what he used the custom rack for. The mystery was solved when I saw him one evening with a massive bass in a case leaning perfectly against the rails.